Home Fast Food KFC Open Kitchen Day + Your Questions Answered! Spoiler Alert! 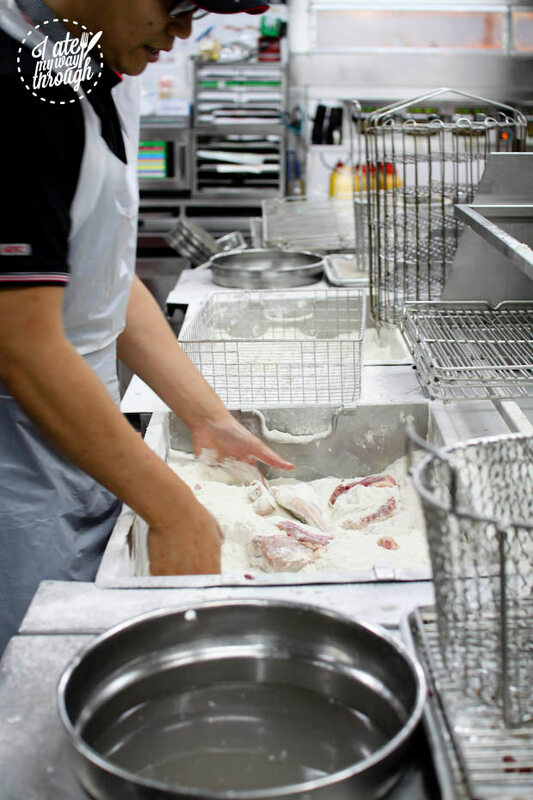 Tomorrow, around 150 KFC restaurants around Australia will open its doors to the public, giving visitors a free 30-minute guided behind the scenes kitchen tour plus two free pieces of original recipe chicken. Alas, only 24 places were available at each of the selected stores and these filled up within days of the announcement some time ago. If you’re registered to go tomorrow, this post is a spoiler to the Open Kitchen Day as we were privileged to attend a media preview late last week. While I don’t frequently consume fast food, of all the fast food chains, KFC is definitely my preferred option as it is the least processed. 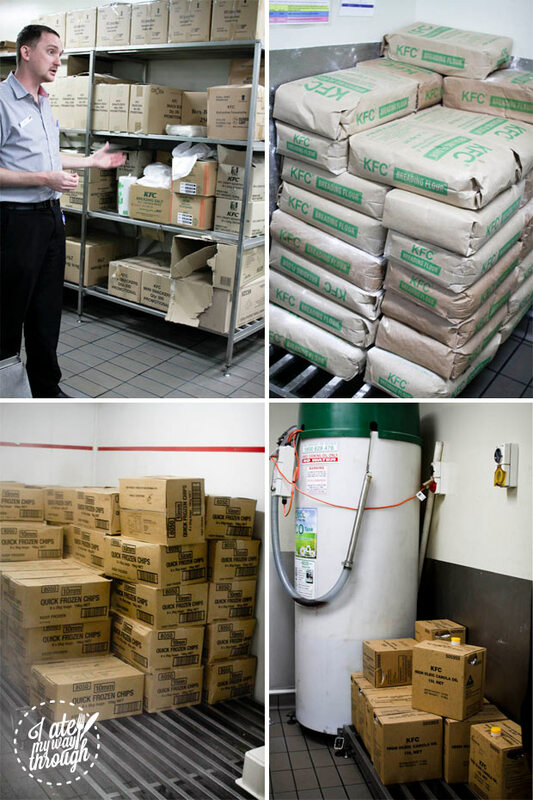 I was greatly excited to attend the behind the scenes tour to see the mystery of KFC’s cooking process unfold. What exactly is the potato and gravy made of? How is the chicken prepared? Before I jump into the kitchen tour, to give you an idea of KFC’s popularity, did you know that there are more than 18,000 KFC outlets in 115 countries and territories around the world serving some 12 million customers each day? On a more local scale, there are over 600 stores in Australia, serving more than 2 million customers weekly! The busiest KFC is store in Australia is KFC’s George Street store in Sydney, which serves over 2 million pieces of chicken each year. Yes, 2 million pieces of chicken! So we’re guided by Fritz Meyer, KFC’s Chief Food Innovation and Technology Officer and KFC Mascot’s Restaurant Manager. 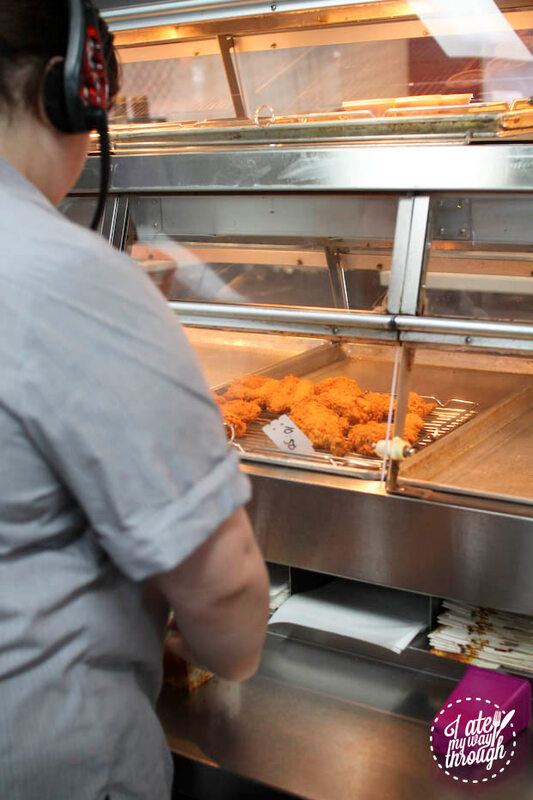 At the counter front, Fritz points out that KFC doesn’t advertise to children – there are no toys in the children’s meals tempting kids to pester their parents for KFC. This is an interesting point as it leads into a conversation about KFC being a treat, even for adults. 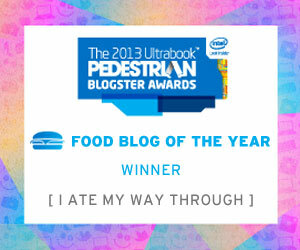 It is important to acknowledge that it is not everyday food. 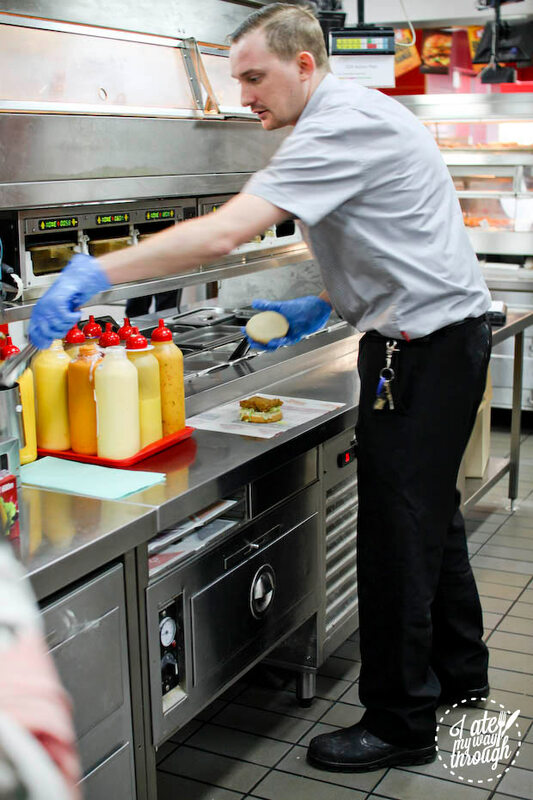 All KFC cooks are required to wash their hands twice prior to touching any food – once with liquid soap and water and once with hand sanitiser. Their taps are also hands-free to ensure no bacteria is transmitted this way. As part of the tour, we’re also required to adhere to these rules and are asked to roll our sleeves up to ensure our arms are washed thoroughly as well. Their fridges have two colour-coded door handles: a red one, which is used by any staff member who has touched raw food products, and a stainless steel handle for anyone who has not touched raw chicken. This ensures there is no cross-contamination in KFC kitchens. Staff are also required to wash these handles regularly throughout the day. Inside the first fridge, cartons of chicken are stacked on top of each other in bright yellow boxes, each with detailed labels on the front. KFC get all of their chicken delivered fresh to the store, almost daily. Their suppliers include the likes of Inghams, Steggles and Golden Farms – the same ones we’d find in supermarkets every day, we’re told. 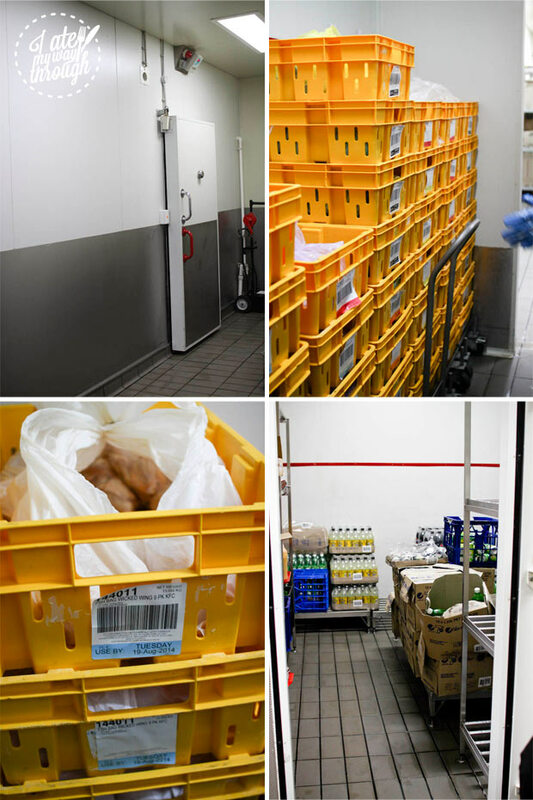 The other fridges are surprisingly bare; the stores only hold onto enough stock for 1 – 3 days. One of the best things about KFC are their chips – I mean, the seasoning on the chips. What you may not be aware of, is that they’ve been slowly lowering the salt content of a lot of their products! As this was slowly done across the board, customers have been able to re-adjust their taste buds so that the salt reduction wasn’t particularly noticeable. In 2010, KFC Australia achieved an average 15% reduction in sodium across core chicken menu items and an average 21% reduction in seasoned chip salt. In 2011, they reduced sodium in their burger buns by 30% and dinner rolls by 37%. Different markets use variants of canola, soy and sustainably sourced palm oil, depending on the supply and availability in different countries. 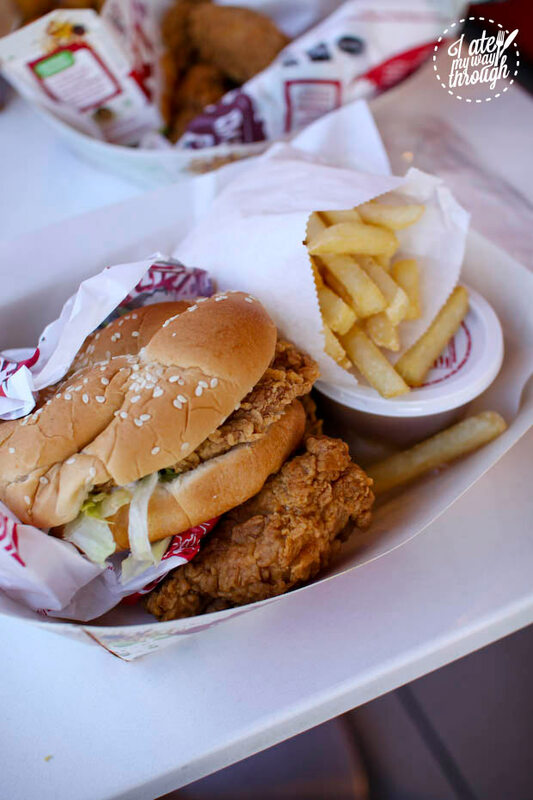 KFC Australia was one of the first to make the switch to canola oil in May 2012. 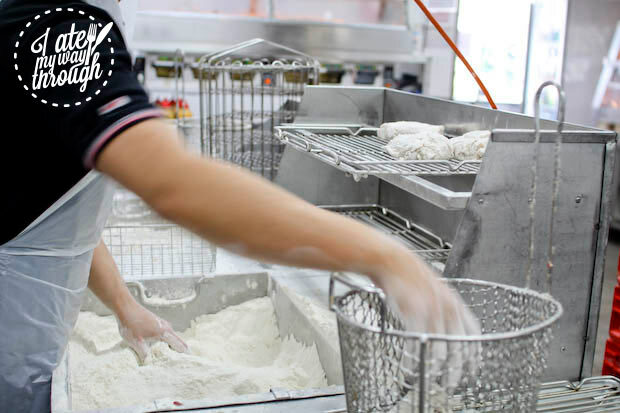 KFC Australia uses locally produced high-oleic canola oil. As we move into the kitchen, I’m instantly drawn to the potato and gravy station. There’s a mixer re-hydrating the mashed potato mix. Using an ice-cream scoop-like device, large dollops of potato are spooned into plastic containers. A sumptuous gravy is then ladled over the potato, completing the iconic KFC potato and gravy combination. 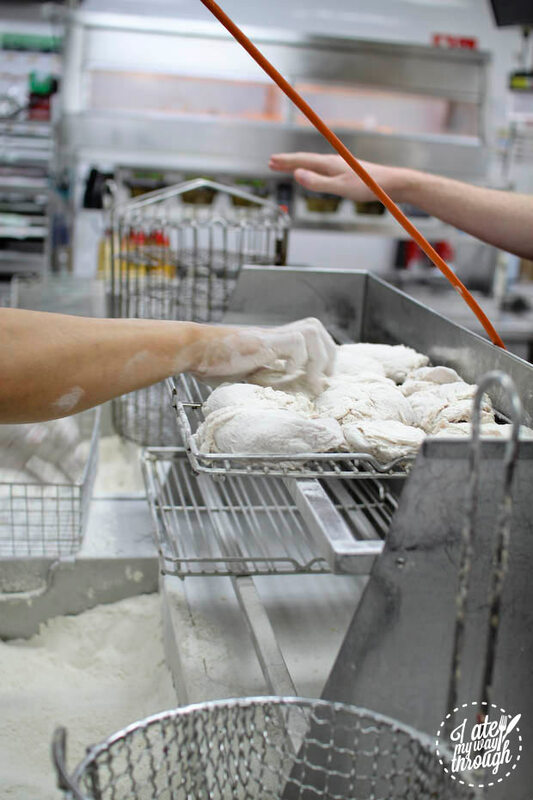 True to their word, as we’re given a demonstration of how the original recipe chicken is made, the cook takes his time to go through the hand-washing process. A dedicated trolley is used to taken chicken out of the fridge. 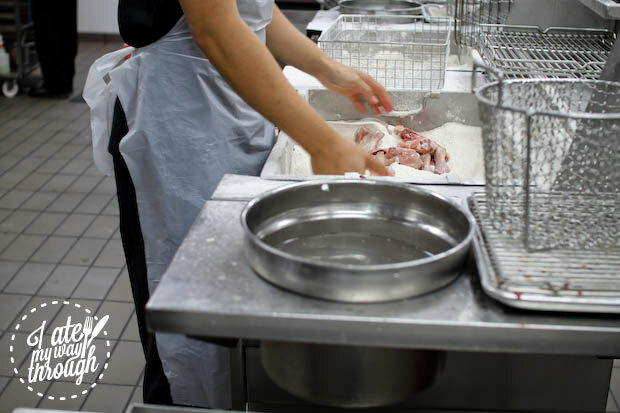 Each piece of chicken is individually cleaned in water by hand. 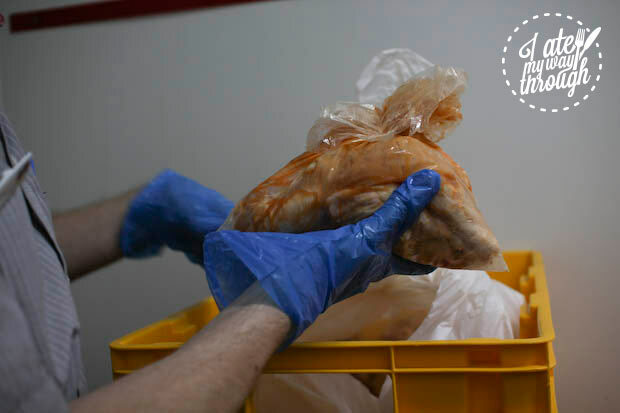 During this stage, bone fragments or excess innards residue are removed, and the wings are turned inside out. The chicken is thrown into the KFC breading mix and tossed through. Drumsticks are double-breaded. 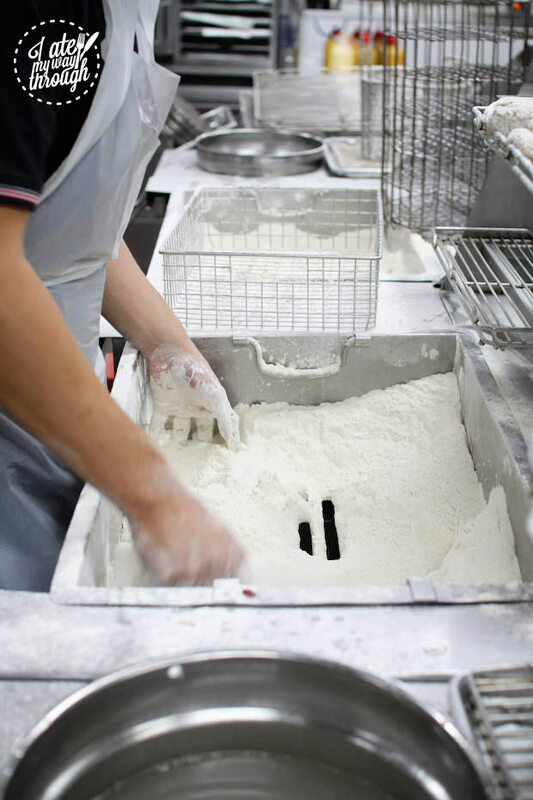 After each batch, the flour is sifted to ensure no chicken bits are left behind. 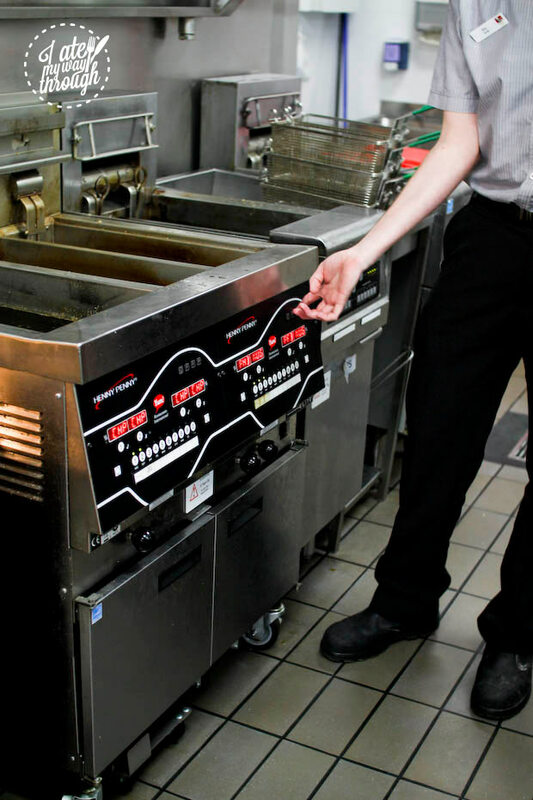 As you would expect at such a large franchise, all the fryers have been preset to specific cooking times and temperatures. There’s a procedure for absolutely everything. Why doesn’t the cook wear gloves when breading chicken? 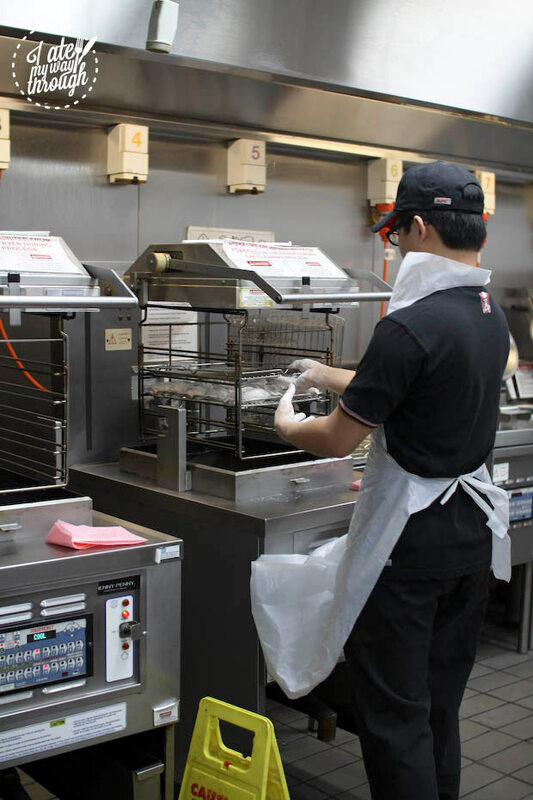 KFC cooks regularly wash their hands to prevent the transfer of contaminants. Using gloves at the cook station presents the added risk of a glove or a piece of glove falling into the breading and being cooked with the chicken. The process of cooking chicken at high temperatures also kills any bad bacteria. How is the gravy made? 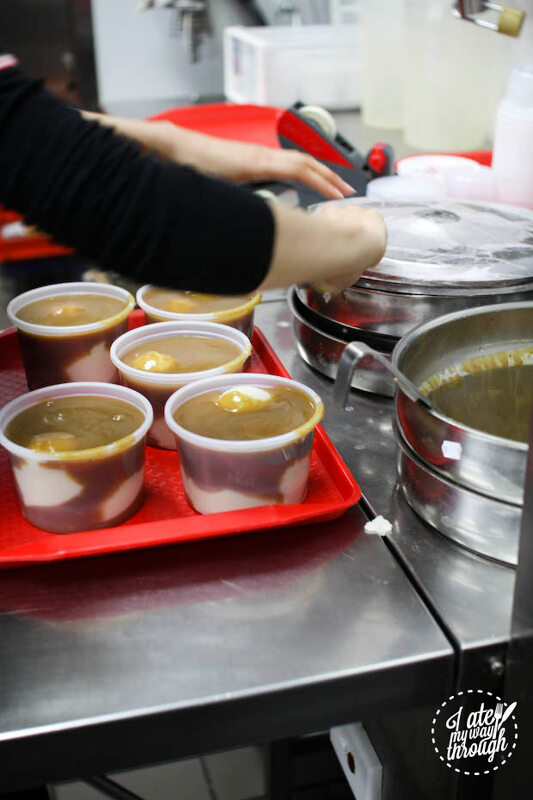 Some gravy in our stores is made in a similar way to how you make gravy for a roast you cook at home, using parts of the chicken and coating that fall away during the cooking process. However, due to the high demand for gravy, stores are also stocked with gravy mix. We understand that there are growing interests in free range. We actually have done a promotion in the past using free range chicken, however demand wasn’t high enough to keep it permanently. All our suppliers do comply to strict industry guidelines and government regulations on animal welfare so all the chickens we use are raised in large environmentally controlled sheds, not cages. Some of our food does contain MSG but rest assured, it’s only present at levels that are safe for the general population as deemed by Australian Food Standards . It’s a recognised flavour enhancer that also occurs naturally in foods such as meat, fish, milk (including breast milk), vegetable, fruit and cheese. We always hear about how KFC tastes different in different countries, what would you say are the main differences consumers would notice in Australian KFC vs other countries? 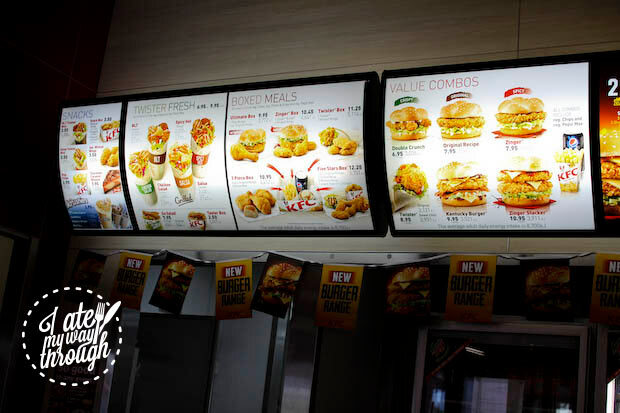 Different KFC restaurants around the world use the same processes, so the taste shouldn’t vary too much in different countries but you might see different products tailored to the specific palates of those consumers. The breading process and ingredients used for KFC’s Original Recipe chicken are actually the same as what Colonel Sanders used decades ago. 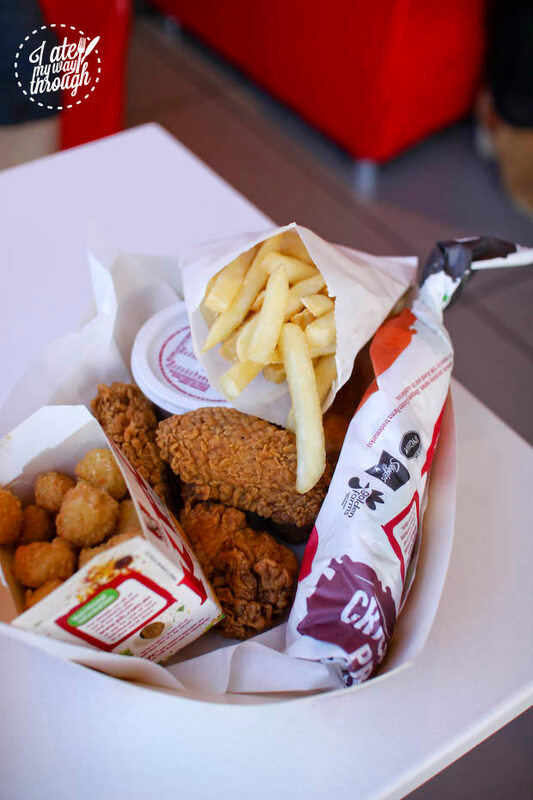 KFC Australia does its best to source ingredients locally and this may therefore result in a naturally occurring variation between countries. What are the special ingredients in the secret herbs and spices? Only two people in the world actually know what’s in KFC’s 11 Herbs and Spices. If you are taking a tour of our kitchen on Open Kitchen Day we can’t guarantee you’ll become the third – but we can guarantee you’ll be a lot closer to the truth behind our freshly prepared, great-tasting food. It would’ve been cruel to end the tour without a taste of some KFC, so Phoebe and I had the All Stars Box and the Zinger Box respectively. It was 11am but this was as good an excuse to eat KFC as any. Mmm, wicked wings. I love the story and legacy of how Colonel Harland Sanders developed the secret formula back in the 1930’s when he operated the Sanders Court & Cafe Restaurant in Corbin, Kentucky. It’s incredible that such a safely guarded recipe has developed such a loyal following of customers. What this tour reinforced to me most, is that KFC is real food. It’s real chicken, fried fresh to order. 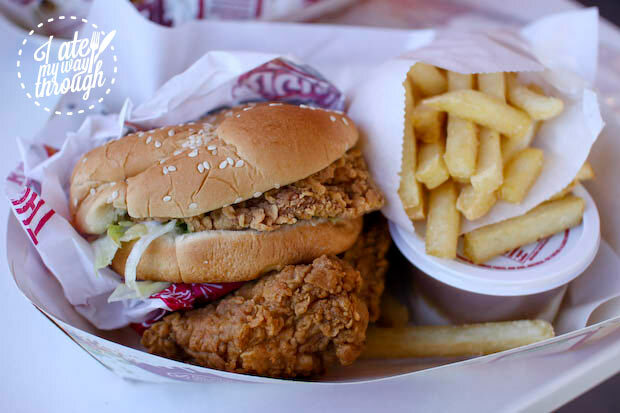 But let’s not forget it’s not healthy to have fried chicken every day OK?